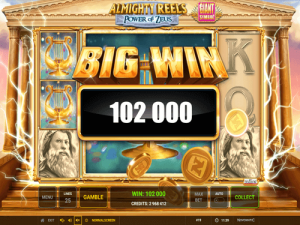 Almighty Reels Power of Zeus is a Greek-themed slot game made by Novomatic. Novomatic are a world-famous game developer. They are famous for developing excellent and high-paying slot machines, online table games, online live dealer games and online slots. They have a mixture of slots and video slots, and their more recent releases are getting more modern! Almighty Reels Power of Zeus is one such game. It’s a video slot with good graphics and a decent bonus feature that gives out Free Spins. The reels are housed in a building that looks like the Parthenon! Greek architecture has stood the test of time, it would seem! The symbols move when you get wins and there are many special visual effects that really bring the ancient Greeks into the 21st century. Zeus was an ancient Greek god. He was worshipped by many Greeks and was known primarily as the god of the sky and thunder. He is the King of Gods in Mount Olympus and is the father of Apollo, Hermes, Helen of Troy, Perseus and more! This particular slot from Novomatic is a 5-reel slot. It has 25 paylines, which are fixed. It also comes with a built-in autoplay function and an optional gamble game. Novomatic have made many comparable slot games in the past. Check out: Apollo God of the Sun, Helena, Coin of Apollo, Almighty Reels Realm of Poseidon and Gorgeous Goddess. Luckily, while you play this game and spin these reels, you’ll have the power of Zeus on your side! To get wins in this game, 3 is the magic number. 4 and 5 are also magic numbers! These are the number of symbols you need to get to match so that you can get some cash. Your bet will determine the size of the wins you can get. Once you’ve fixed your bet, take a peek at the paytable. Each symbol in the Almighty Reels Power of Zeus Novomatic casino slot has an individual payout value for triple matches, quadruple matches and quintuple matches! The power of Zeus only goes from left to right, so this is the way the matching symbols will need to fall. If they follow one of the 25 paylines, they will give you the cash win! This will either be added to your balance or you can gamble it – whatever you choose! The gamble game is the same as the gamble game of Book of Ra Deluxe and gives you a 50% chance of doubling your win. Not every symbol is worth the same amount, so some symbols give out bigger payouts! As you might have guessed, Zeus gives out the biggest payouts of all. In descending order, he’s followed by: the ancient Greek helmet, the vase, the lyre, the shell, the Ace & King and the Queen, Jack & 10. There are two additional symbols that appear in the game – but these have special powers! There’s a Wild symbol and a Scatter symbol. The Wild symbol is a picture of a golden Parthenon and the Scatter symbol is an ancient Greek gold coin. Both of these extraordinary symbols are typical of Novomatic slots. Any ordinary symbols can be substituted by the Wild, and the Free Spins are started by the Scatter! Some Novomatic online slots don’t have very interesting bonus games. However, Almighty Reels Power of Zeus has a great bonus game! In total, the slot awards 10 Free Games. These are spins which don’t use your bet, but you can win big from them! In fact, you have a very good chance of winning big, thanks to the colossal symbols feature! When the Free Games are triggered, one of the high-paying ancient Greek symbols will be chosen for special duty. This will be: Zeus, the helmet, the vase, the lyre or the shell. The selected symbol will appear as normal but may also become colossal during the Free Games! As a colossal symbol, it can take up to 9 positions and cover the entire middle three reels. It won’t always land covering all of them, and may land only showing a part of the colossal symbol (3 positions or 6 positions). It will give wins as usual, each position the colossal symbol covers will behave like 1 of the normal-size symbols and will give the relevant wins.